I work in the areas of spatial audio, computational physics, and computer graphics. I enjoy researching fast approaches to simulate physics in virtual worlds to make them more believable. Over the last decade my focus has been sound synthesis and propagation. My research on Triton has brought accurate wave-based propagation effects to major games and virtual reality, experienced by millions of people worldwide. Triton has now evolved into Project Acoustics: a Microsoft product that makes the technology available for all. 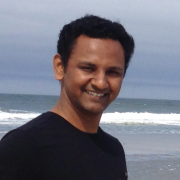 Nikunj leads research projects at Microsoft Research’s Redmond labs in the areas of spatial audio, computational physics, and computer graphics for games and AR/VR. As senior researcher he’s tasked with conceiving new research directions, working on the technical problems with collaborators, mentoring interns, publishing findings, giving talks, and engaging closely with engineering groups to translate the ideas into real-world impact. Over the last decade he has led project Triton, a first-of-its-kind wave acoustics system that is now in production use in multiple major Microsoft products such as Gears of War & Windows 10. Triton now ships as a Microsoft product: Project Acoustics. Nikunj has published over 25 papers, and actively participates in academic communities in both graphics and audio. He has served on program committees for ACM SIGGRAPH, ACM SCA, ACM Multimedia, and given talks at ACM SIGGRAPH, Audio Engineering Society, Acoustical Society of America, and Game Developers Conference. Before Microsoft, he did his PhD studies at UNC Chapel Hill, where his work helped initiate sound as a new research direction. His entire thesis code was licensed by Microsoft.